PM Trudeau: Is this the Islam you want to promote in Canada? If you know nothing about this event, it is because main stream media did not report on it or the guest speakers. Guests included Linda Sarsour, Siraj Wahhaj, Lord Nazir Ahmed, Boonaa Mohammed and Ustadh Abdel Rahman. Linda Sarsour is a co-chair of the national Women’s March and founder of a political activist group called MPower Change. She is embraced by the Democratic party of the USA and the woman’s movement. In other words, humanizing Israel, the Jewish state, is unacceptable, reminding us of the Nazi playbook as Hitler said one must dehumanize Jews. Ms. Sarsour, has been criticized for her support of convicted Palestinian terrorist Rasmea Odeh, who spent 10 years in an Israeli prison for her role in a 1969 bombing attack at a Jerusalem supermarket that killed two Hebrew University students, Leon Kanner and Eddie Joffe. She was in a prisoner exchange with the Popular Front for the Liberation of Palestine in 1980 and immigrated to the United States. Sarsour also stated that there is no room for Zionists (in many cases a euphemism for Jews) in the feminist movement. Linda Sarsour has been praised by Democrats like Hillary Clinton, Bernie Sanders and Alexandria Ocasio-Cortez. Think about that. 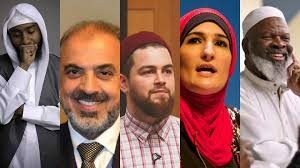 The Democratic Party of America embraces Linda Sarsour and her views on Jews and Israel, the only country in the Middle East where Jews, Muslims and Christians live together. There are no Jews in the 23 Muslim countries that surround Israel in the Middle East and North Africa and any “Palestinian” state will have no Jews at all. Saudi-educated Imam Siraj Wahhaj, identified by U.S. prosecutors as an unindicted co-conspirator in the 1993 World Trade Center bombing, was a character witness in the trial of Omar Abdel-Rahman, who is linked to the attack, describing him as a “respected scholar” and “strong preacher of Islam.” Wahhaj has also denounced “lesbianism and homosexuality” in Islam and condemned North American laws for not forbidding “fornication and adultery.” Both of the links are no longer available. Wahhaj ‘s sons and daughters were recently involved in the New Mexico compound where it has been alleged by prosecutors that children were trained to be school shooters. On his website and social media channels, Toronto-based, spoken-word artist, writer, performer and Dawah (propagating Islam) activist, Boonaa Mohammed complains about being picked on by “lots of rich yahudi kids,” maintains conspiracy theories about the Sept. 11, 2001 terror attacks, accuses “evil Zionists” of controlling “the media and foreign affairs,” and compares Israeli policy to the Nazi regime, which is clearly antisemitic under the International Holocaust Remembrance Alliance (IHRA) definition. October 7, 2015, Boonaa Mohammed, sent an open and alarming message to Prime Minister Stephen Harper. In a video clip posted on YouTube, Boonaa Mohammed accused Harper of “hating” Muslims and betraying Canadian values by spreading rancour towards Muslims. He called on Harper to leave the country as he does not represent or belong to Canada. In other words, one may conclude that Boonaa Mohammed implicitly portrayed Harper as a traitor and an enemy. Harper’s political rivals did not denounce the disturbing message and the mainstream media kept ignoring the threat. Nazir Ahmed, a member of the British House of Lords, has a laundry list of antisemitic occurrences to his name. In 2013, he blamed a “Jewish conspiracy” after he was convicted of dangerous driving and criticized his “Jewish friends who own newspapers and TV channels.” He also blamed “the Zionist lobby” when an Iranian propaganda network was banned in the UK and said British Jews who fight in the IDF “should be arrested.” In 2012, Ahmed drew the ire of his colleagues when he condemned former U.S. President Bush and former UK Prime Minister Blair for “committing war crimes in Iraq and Afghanistan.” He resigned from the Labour Party months later. Sheikh Abdul Nasir Jangda, who was also a guest speaker at the convention, is Murphy’s colleague at the Qalam Institute which he founded and directs. You can read his views here and here including his calls to eradicate Israel. Should not those same responsibilities fall on the shoulders of organizations like ICNA when they promote speakers in Canada? Isn’t it the call of our Prime Minister that we be a tolerant, inclusive accommodating country that promotes diversity? How do these speakers fit in with Trudeau’s views on Islam as he has told us over and over that Islam is compatible with the West?